When a lighthearted conversation in French with the manager of her favorite bakery turns into a job offer, Lexi accepts. But the actualglamour is minimal: the pay is less than generous, her co-workers are skeptical, her bank account remains vertically-challenged, and her parents are perpetually disappointed. Her only comfort comes from the flirtatious baker she has her eye–but even may not be who he seems to be! So when a handsome young executive dashes into the bakery to pick up his high profile company’s special order for an important meeting–an order Lexi has flubbed– she loses her compulsion to please. “What am I going to do?” he shouts. “Let them eat cake!” she fires back with equal passion and a nod to Marie Antoinette. And then, something inside Lexi clicks. Laissez la révolution commencer! Let the revolution begin! Instead of trying to fulfill everyone else’s expectations for her life, Lexi embarks on an adventure in trusting God with her future–très bon! This book is written from a lightly, organically, Christian world view. A sweet premise, but falls flat. 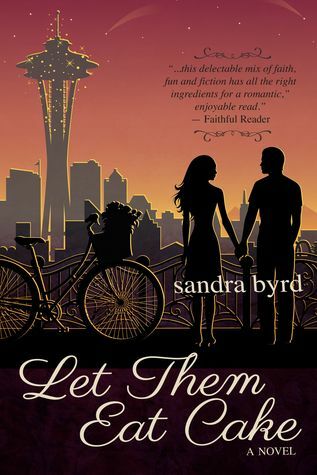 I picked up Let Them Eat Cake sometime in 2013 from a free Kindle ebook sale. I honestly couldn’t remember when I had started reading the story until I checked on Goodreads (thank God for Goodreads!). But this illustrates precisely what the trouble is with the story, as well. I found it somewhat flat, a bit slow, and, on the whole, forgettable. The premise seemed enjoyable: down-on-her-luck Lexi Stuart finds herself securing a job at a French bakery in Seattle. The job doesn’t pay much, but combines Lexi’s passions for France and baking, and Lexi is hopeful of a promotion. But the lack of a job, a poor financial situation, and lackluster prospects in her love life frequently seem to be more than Lexi can handle. Rather than endearing herself to readers, Lexi often reads as whiny and annoying. She counts on a promotion that she has no idea will come to fruition, to the point of signing a lease on an apartment that she’s only-sort-of-maybe be able to afford if the promotion comes through. And she counts herself a failure for being single and unattached – a personal pet peeve in any story! What I didn’t realize when I picked up the book was that it is Christian chick lit. I don’t have anything against the genre; in fact, I have read very little of it and, generally, it just wouldn’t normally be something that I would read. Sadly, Let Them Eat Cake did nothing to change that particular predilection. The references to faith, God, church, the Bible, and Bible verses increased in frequency throughout the book and often felt forced and out of place. I did enjoy reading about one of my favorite places – Seattle – and the descriptions of treats and tarts were mouth-watering. And, I always love it when books include recipes! Overall, though, this book was more like day-old bread: kind of stale. Yeah, definitely not something I’d usually pick up — doesn’t sound very “lightly, organically Christian” if it’s liberally peppered with Bible passages, etc. Sorry this didn’t work for you! It’s never a good sign when a reviewer compares a book to stale bread. o_O Thanks for your honest review, and for saving me the pain of trudging through this one, even if it is a free read. I always dread and dislike giving unfavorable reviews but, this one just wasn’t my cuppa, you know? This doesn’t sound like my cup of tea either.